The greatest love stories of all time start with a funny feeling in the middle of your heart. Even the coldest soul is no match for the warmth of true love and undying passion! Love makes your face beam with brightness. It puts a bounce in your step and a song on your lips. Glowing Heart Address Labels from CheckAdvantage illustrate that unmistakable emotion with colorful hearts surrounded by a soft white radiance. Use them on your outgoing mail to save time, and to spread a little love with every envelope you send. Get your very own Glowing Heart Address Labels now! 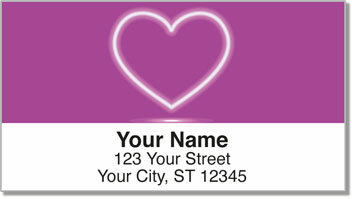 This delightful design can also be ordered as a set of personal checks.